Trichoderma (teleomorph Hypocrea) is a well-established fungal genus that has been the subject of numerous reviews [1–4]. In brief, Trichoderma spp. are mycoparasitic, facultative plant-symbionts that colonize a broad range of plant root systems. Trichoderma-derived plant benefits include enhanced lateral root development, increased nutrient uptake, resistance to abiotic stressors such as heavy metals and reactive oxygen species, and priming plants for pathogen resistance via triggering of ISR (induced systemic resistance). Consequently, Trichoderma spp. are widely used as agricultural bio-control agents. While new molecular investigative techniques have exponentially advanced our knowledge of Trichoderma, much remains to be discovered on the mechanisms by which Trichoderma spp. affect plants. Once inside the plant, Trichoderma spp. effect change on phytohormone levels, specifically of phytohormones jasmonic acid (JA) and salicylic acid (SA) which pay central roles in orchestrating plant defense. It has been shown that T. virens generally suppresses SA in early colonization and then enhances JA levels to mediate ISR [9–12]. Plant growth hormones, i.e. indole-3-acetic acid (IAA), also have a correlational response to Trichoderma colonization of plant roots . The molecular mechanisms behind T. virens influence on these phytohormones are a subject of current interest. Many secreted proteins, metabolites, and enzymes also are known to play roles in Trichoderma – plant symbiosis. SM1 is a secreted protein of T. virens which suppresses the maize gene ZmLOX3 to stimulate ISR [14–16]. Peptaibols, produced from non-ribosomal protein synthases, can affect both plant growth and disease resistance [17, 18]. Cell wall degrading enzymes (CWDE) are utilized for colonization – these also have current biotechnology applications. For example, CWDE isolated from T. reesei are already used for potent cocktails to degrade biofuel feedstock . Continued exploration of the secondary metabolites, secreted proteins, and enzymes which Trichoderma utilizes within a plant host is important to informing future bio-industrial products. For example, supporting crop growth on marginal land would be benefitted by fostering Trichoderma’s ability to mitigate abiotic stress on plants, and optimization of bio-control agents requires a thorough understanding of how influential proteins are regulated and secreted. A total of 28 and 88 DEGs were annotated as being carbohydrate activated enzymes (CAZ) in Recognition and Colonization, respectively. 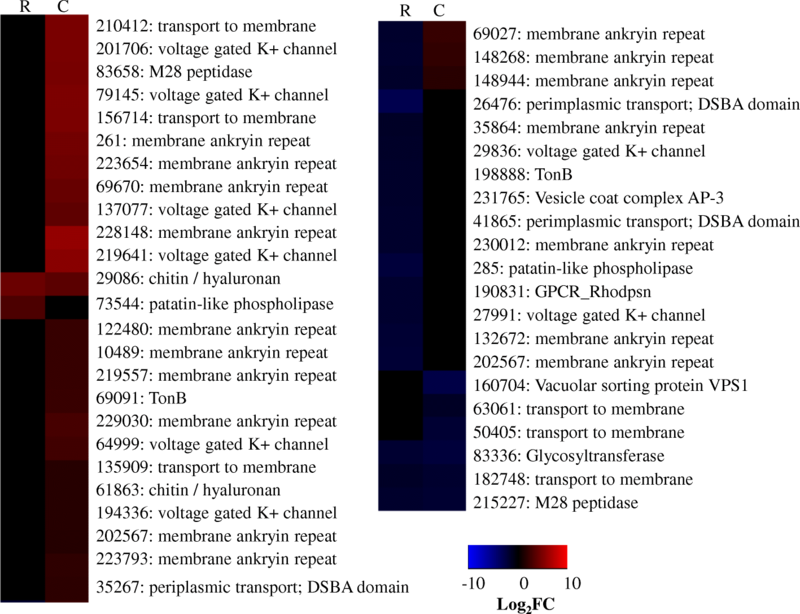 These DEGs ranged across multiple glycosyl hydrolase/transferase families. The importance of glycosyl hydrolases in T. virens colonization of maize and tomato has been noted in previous studies [20, 21]. We focus here on the CAZ specifically annotated as being cell wall degrading enzymes (CWDE), including chitinases, cellulases, pectinases, arabinofuranosidases, laccases and other lignin-degrading enzymes . While these CWDE’s may have been involved in mycoparatism or self-cell wall remodeling, the presence of lignin and pectin degrading enzymes suggests catabolism of plant cell walls was likely occurring [22, 23]. Whether this catabolism functioned to aid T. virens ingress of root intercellular spaces or served as a nutritional source in planta is unclear [22–24]. In general, the CWDE’s were either not significant or repressed during Recognition; coordinating well with the data that the fungus had not yet made ingress into the plant roots. 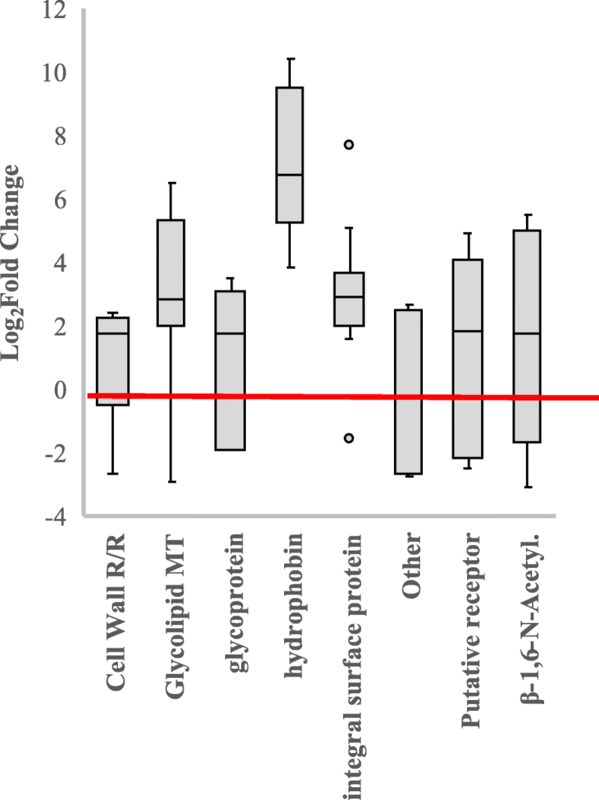 The repression of specific CWDE may also be linked to avoidance of plant defenses. CWDE’s have been shown to elicit plant defense as PAMPs in other organisms [25–28]. Five putative CWDE’s were, however, still enhanced during Recognition. Two of these were chitinases also enhanced during Colonization (DEGs 150035 and 42107). 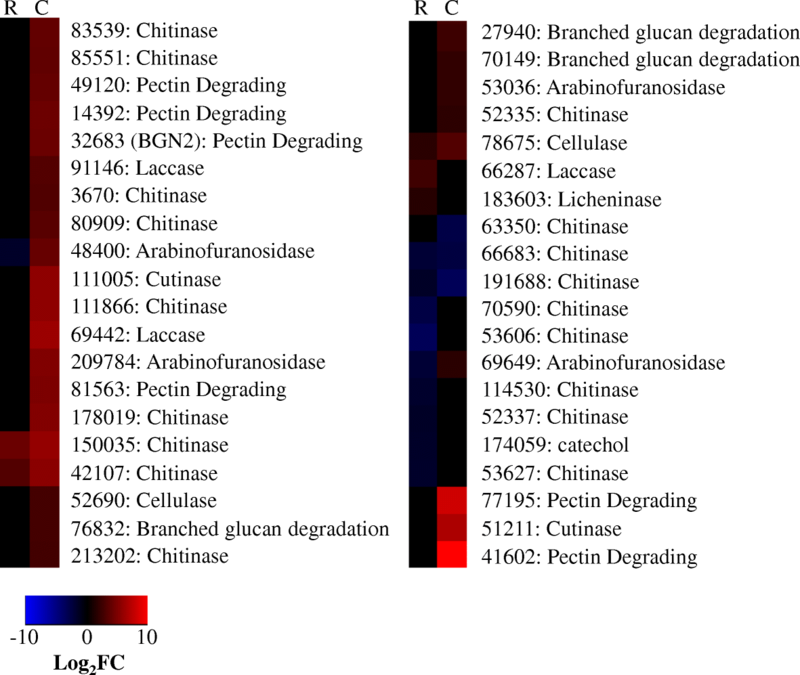 A further two chitinases (DEGs 63350 and 66683) were repressed in both datasets (Fig. 2). During T. virens colonization of maize, pectinases appeared to play a highly important role. The highest transcriptional enhancement was a pectin-degrading enzyme (DEG 41602), which expression was 11 log2fold more abundant than the control. Another pectinase (DEG 77195) was expressed 8 log2fold over the control. 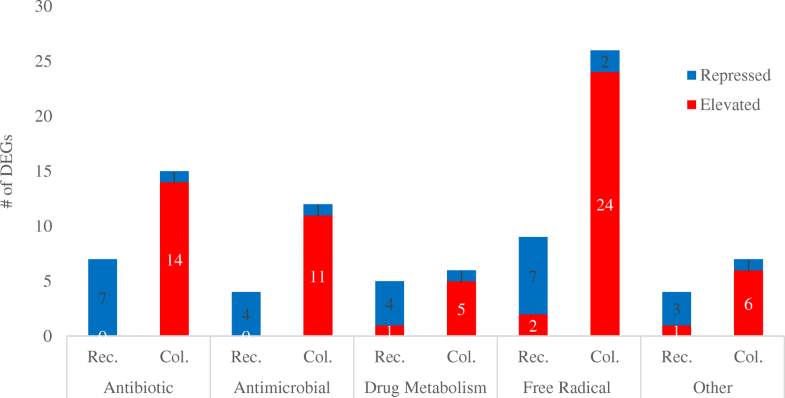 Five additional pectinase DEGs were enhanced during colonization, albeit to a lesser degree. Although Trichoderma genomes have comparatively few pectinases in relation to other CAZ and proteases, the T. virens genome contains pectinases capable of degrading multiple pectin architypes, indicative of the ability to colonize many different plant hosts [29–31]. Thus, the subset of pectinases enhanced in this study may represent T. virens response to maize on a host specific level. Morán-Diez et al. also found that the pectinase 77195 was enhanced during colonization of maize roots, but not tomato roots. 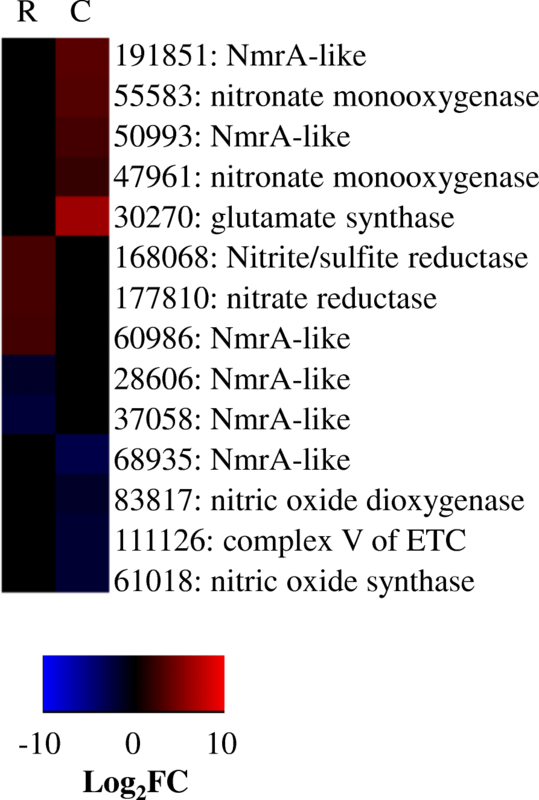 Association with maize prompted alternate expression of several oxylipins by T. virens. Note that many of the genes annotated as potentially being involved with oxylipin synthesis are unspecified monooxygenases or P450 CYP2 sub-family cytochromes. Their role in specific oxylipin synthesis will need to be verified by further research. Such research will be important to further unravel Trichoderma-plant interaction as oxylipins are prominent candidates for inter-kingdom signaling molecules  Lineolate acid epoxide derivatives have been shown to be involved in anti-fungal defense mechanisms, cross-talk between fungi and their plant hosts, and in JA biosynthesis [35–38]. Our analysis identifies 15 DEGs involved in lineolate acid metabolism. Arachidonate acid metabolism is another venue for oxylipin production, synthesizing HETE and DHET oxylipins. This study identifies 17 DEGs as potential producers of 20-HETE, 19(S)-HETE, 16(R)-HETE, 11,15,15-THETA, 11,12,15-THETA, 14,15-DHET, 11,12-DHET, 8,9-DHET, and/or 5,6-DHET (See Additional file 3: Data file S2; Oxylipins). DEG 190955 is of special interest as this monooxygenase has the potential to influence oxylipins production from either lineolate or arachidonate metabolism and was enhanced at both Recognition and Colonization, 3.6 and 8.7 log2fold, respectively. Reactive oxygen species (ROS) were likely prominent in the in planta environment as T. virens enhanced 16 glutathione-metabolism genes, 4 catalases, and 1 peroxidase. 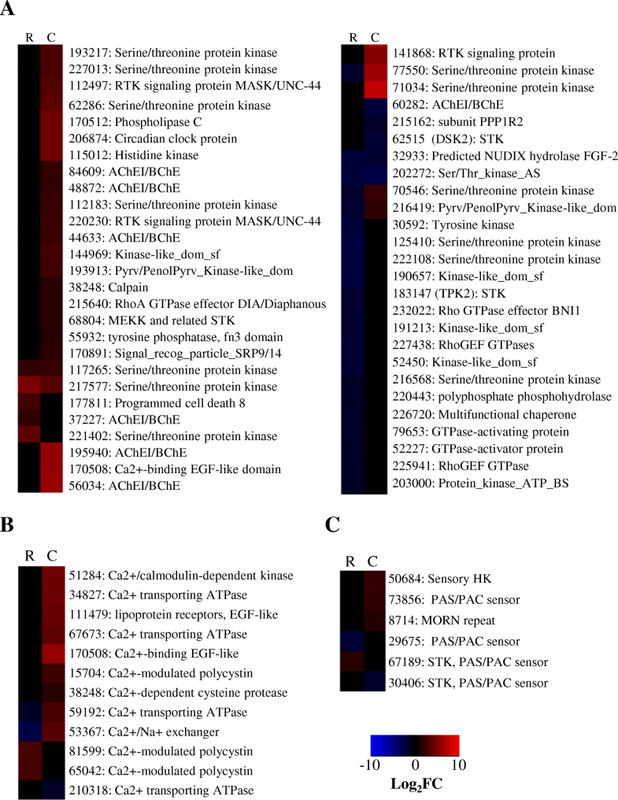 Note that 2 peroxidase genes were repressed (Fig. 5, Additional file 3: Data file S2). ROS are common in plant stress signaling (reviewed in ref. ), and plant defense systems [48–50]. ROS burst can also occur when a symbiotic microorganism colonizes a plant host, as noted by Santos et al. with alfalfa and Sinorhizobium meliloti. Trichoderma spp. can help plants alleviate heavy-metal induced ROS accumulation by expression of glutathione enzymes [7, 52–54]. We hypothesize therefore that the expression of glutathione metabolic genes by T. virens in maize could serve a dual role of self-protection and plant health promotion. Trichoderma spp. produce a plethora of secondary metabolites, both of high (peptaibols) and low (ETPs, terpenes, steroids and polyketides) molecular weight, and their genomes are rich in genes related to secondary metabolites biosynthesis and transport . These secondary metabolites have widely-acknowledged roles in influencing plant growth, development, and disease resistance [2, 18, 55–57]. To conduct a comprehensive analysis of regulation of secondary metabolism-related genes and gene clusters during interactions of Trichoderma with roots, we created a database by identifying nearly all the genes putatively involved in secondary metabolism biosynthesis in T. virens (Additional file 5: Data file S3). This database of genes is unique in our analysis in that more genes were affected during Recognition than Colonization, although the trend of the majority of DEGs being repressed during Recognition was conserved. Note, since we wanted to capture any change in a gene cluster, we considered a gene significant if the p-adjust value was < 0.05, regardless of whether the log2fold change was ±1.5. Below we discuss which specific non-ribosomal peptide synthases (NRPS), polyketide synthases (PKS), and other secondary metabolites gene clusters were found significant in this analysis (Fig. 6). T. virens extracellular structures appeared to undergo swift remodeling starting upon exposure to maize roots and continuing through colonization. 31 extracellular / cell wall DEGs were found during Recognition and 53 during Colonization (Additional file 3: Data file S2). These genes represent hydrophobins, glycoprotein-associated, cell wall structures, adhesions, and glycolipid/glycophospholipid metabolic genes. Fungal cell wall and extracellular structures often mediate the initial fungal-microbe interaction [26–28, 38, 66]. The DEGs identified here will require additional empirical analysis to determine their roles in plant attachment and/or suppression/evasion of plant defenses. An additional six STKs were identified as DEGs specifically during Colonization of maize roots; five of these were enhanced while only one was repressed. STKs in Trichoderma are best studied in the context of MAPKs (mitogen activated protein kinases). Roles for MAPKs have been found in hyphal growth, conidiation, mycoparatism, and mediation of ISR [4, 77–79]. Each MAPK signaling cascade appears to be specific to a particular process thus the STKs in our study could represent uniquely plant associated signal transduction mechanisms. Plant-hosts provide a rich array of metabolites for fungal consumption. Consequently, many DEGs were classified as having metabolic function (Additional file 3: Data File S2). Analysis of these DEGs suggests that T. virens was converting plant produced sucrose to fructose or glucose and then to pyruvate (Fig. 11 and Table 1). 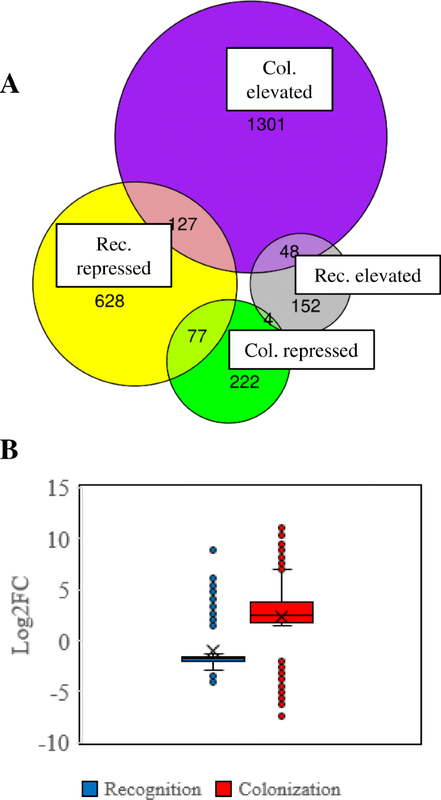 Transcription of sucrose metabolic genes during T. virens – maize colonization was expected as sucrose is a key ingredient in T. virens – plant interactions [82–84]. Sucrose metabolic genes, however, were not altered until after root recognition. This would suggest that sucrose is not perceived by the fungus as an indicator of plant roots. Also unexpected was the abundance of transcripts capable of converting pyruvate into ethanol during colonization (Fig. 11). Such metabolite activity should be explored for potential in bio-fuel production.